Our nature walks provide a variety of ways to learn about the Bay and experience the sights and sounds of nature – all for FREE. For most walks, they are two hours so make sure to bring appropriate footwear, sunscreen and binoculars if you have them! Click HERE to view/register for any of the hikes below. 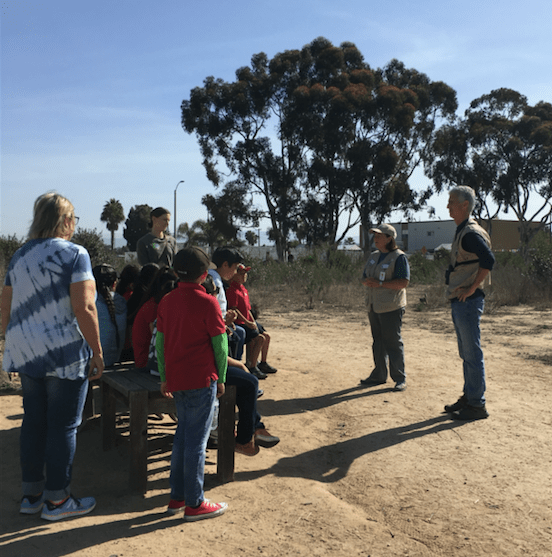 Meet other families at the Peter and Mary Muth Center’s patio one Saturday a month for an easy hike for all ages to learn more about the Bay and enjoy the trails around it. The hike is only an hour — depending on the weather and will be on both paved and dirt trails. No formal program, as it’s a great introduction to the Bay and a Naturalist will talk about whatever you discover along the way. For those of you who are interested in a more intense bird-watching experience and the possibility of seeing something rare, Sea & Sage bird expert offers a 2 -3 hour outing at Big Canyon on the last Sunday of the month (except in December). All species documented on eBird.org. Suitable for beginners and advanced birders. Join the California Department of Fish & Wildlife Naturalist to learn about Shellmaker Island’s rich history; the future of the Back Bay Science Center; and discover unusual and endangered plants, birds and crab habitats. RSVP to 949-640-9956 or Kathleen.sheridan@wildlife.ca.gov. Have a group of ten or more? We can and pair you up with a Volunteer Naturalist to go exploring. Naturalists have varied specialities. Suggested donation of $2-5 per person to help us train our next generation of Volunteer Naturalists. Contact info@newportbay.org. For links to walking tours and other activities within our watershed, visit www.letsgooutside.org.